Manchester United goalkeeper David De Gea is frustrated about lack of support from the Spanish fans after yesterday's game. David De Gea made a big error during yesterday's game by gifting Portugal a goal after pushing Cristiano Ronaldo's shot into his own net. In a game like that of yesterday, many would argue that mistakes are not allowed and De Gea should have done better. The game ended 3-3 after 90min and Cristiano Ronaldo scored the 51th hat-trick of his career. 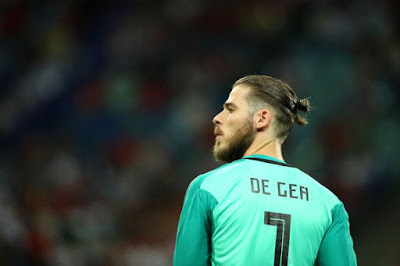 After the game, De Gea point out lack of support from the Spanish fans and believes he hasn't kill anyone to deserve such punishment by the Spain supporters. Spain takes on Iran in their next game on June 20th and De Gea will look to put all the criticism behind him before the game.